Children who interact with disabled children, or even watch them interact with other nondisabled children, develop healthier attitudes toward those with disabilities than kids who internalize their preconceptions, a new study found. As rates of mental disabilities continue to climb — autism spectrum disorder (ASD) now affects one in 88 children under eight years old, dropping to one in 54 for boys — the familiarity with which children learn to grow up beside the disabled becomes increasingly vital. According to a study conducted by University of Exeter Medical School, increased exposure to people whose range of abilities is more limited than others’ builds prolonged comfort, not only with the specific disability, but also with encountering diversity more broadly later in life. Disabilities can range in nature and severity across all senses in a person’s body. Simple physical deficits in hearing or vision fall on one end of the spectrum, while debilitating mental impairments such as ASD, schizophrenia, bipolar disorder , and Tourette syndrome fall on the other — requiring significantly more medical attention and possibly producing a raft of negative attitudes in unaware, unfamiliar observers. Hoping to overcome this discomfort, MacMillan’s study consisted of 1,520 children aged seven to 16 who completed a survey designed to assess their attitudes, contact, empathy, and anxiety toward disabled people. The doctoral candidate found that increased exposure reduced feelings of anxiety, thus improving their overall attitudes toward the disabled. 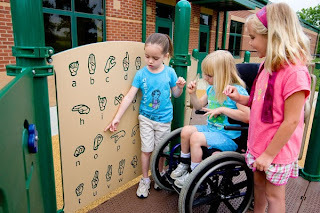 Interestingly, her study showed the same results across direct and indirect interaction exposure, “indirect” referring to the observation of other nondisabled children playing with the disabled. “Simply observing others interacting with disabled children or being aware that others are friends with them can improve attitudes. This ‘indirect contact’ reduces anxiety and increases empathy towards disabled people,” reads the statement released by the British Psychological Society. Discrimination stands as the greatest wall between nondisabled children and those with mental or physical impairments. Often, negative attitudes and unkind gestures come from a lack of understanding, which produces unempathetic and anxious responses. Macmillan notes that these attitudes typically stem from a place of fear, or discomfort, rather than sheer malice. Currently, an estimated 37 million to 56 million people live with a disability, according to the Centers for Disease Control and Prevention.